The language arts lessons develop the structure, organization, and mechanics that are the building blocks of good writing. 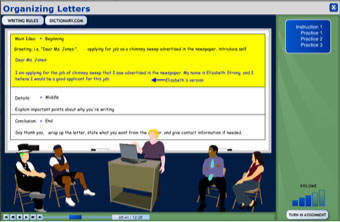 With a goal to communicate clearly and effectively, students apply writing techniques to real-life writing scenarios found in work and school. In the writing course, students learn the purpose of standardized spelling, grammar, and punctuation, and how language skills make everyday tasks easier. Students learn skills for organizing their writing, and also learn about how to write and self-evaluate an effective essay. The skills students acquire will prepare them for jobs or higher education. Organization is a tool of communication, not an arbitrary imposed structure. The writing course teaches organization of sentences, paragraphs, and complete work. Students learn to effectively communicate through developing and supporting a main idea, and organizing work in a natural way that includes a beginning, middle, and end. Lessons emphasize how subjects and verbs function as the building blocks of basic and advanced sentence structure. Students learn about phrases and clauses, run-on sentences and sentence fragments, modification, parallelism, and coordinate and subordinate clauses. The focus of lessons is on clear communication. Usage lessons cover verb tense and subject-verb agreement, as well as clear use of pronouns and referents. Beyond mere language rules, students learn to improve their writing through avoiding cliches and awkward wordings, as well as avoiding confusing shifts in point of view. Language mechanics covers basics that students should be familiar with to communicate clearly and professionally, including spelling, capitalization, and punctuation. Students learn fundamentals of essay writing, including what is specifically expected from the extended response essay and how to work on a timed essay. The lessons include information on how to read prompts and how to self-evaluate writing. 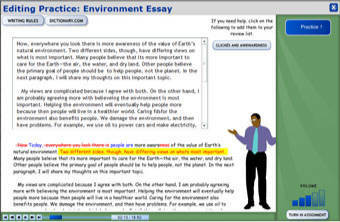 Students practice writing their own essays, as well as practicing editing and revising student essays. 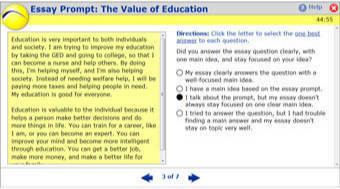 Gaining practice with multiple choice questions as well as the extended response essay, students familiarize themselves with what to expect from language arts portions of high school equivalency exams. They will be better able to focus on answering the questions instead of navigating the interface. Provides practice in reading, writing, math, science, and social studies in three books. More about Essential Skills Workbooks. Know for certain that your students are learning.